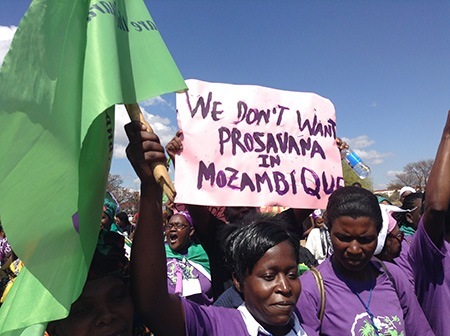 (Bulawayo, Zimbabwe) UNAC, the Mozambique Union of Farmers, a member of La Via Campesina regionalises its “NO To ProSavana” campaign. The ProSavana, a mega agri-business project, is located in Mozambique and involves Brazil and Japan. The project, if developed, aims to turn 14.5 million hectares of agricultural land in the Nacala Corridor in Northern Mozambique, currently being used by small-scale farmers, into industrial monoculture agriculture driven by corporations for export production. UNAC participated in the Southern Africa Development Community (SADC) People’s Summit in Bulawayo, Zimbabwe. It saw the regional gathering as an opportunity to promote and expand its campaign, and to seek and build support from other regional movements against the Prosavana project. UNAC, during the agricultural and land policies plenary, shared experiences on the project and how some of its farmer members have been affected. UNAC, the Mozambique Union of Farmers, a member of La Via Campesina regionalises its “NO To ProSavana” campaign at the Southern Africa Development Community (SADC) People’s Summit in Bulawayo, Zimbabwe.